Hay and Straw Fettuccine is a very rich pasta dish but nice to indulge in once in a while. Straw and hay refers to the combination of egg pasta and spinach pasta that are used. It is sometimes called Florentine Fettuccine. 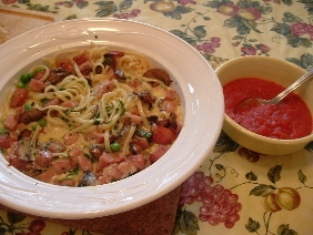 This recipe is very similar to one known as Spaghetti alla Carbonara. You can substitute regular linguine for the fettuccine. It may be served with a little tomato sauce on the side that is blended by tablespoons into the pasta as you eat it. The tomato sauce helps to balance the rich cream. We like it both ways. Melt the butter in a small saucepan. Add 2/3 cup cream and Parmesan to the butter and bring to a simmer. In a small bowl, whisk together 1/3 cup of cream and the yolks. Slowly pour the hot cream into the bowl to temper it. Add the pepper. Whisk to combine. Return the mixture to the saucepan and set it aside off the heat. In a large skillet, saute the mushrooms with 1 tablespoon of butter for 2-3 minutes. Add the onion, prosciutto or ham, and garlic. Saute until the prosciutto is crisp and onions are slightly golden, 3-4 minutes. Remove from the heat. In the meantime, cook the fettuccine in boiling salted water until al dente. Add the peas to the cooking pasta just to heat through. Drain the pasta and peas into a large serving bowl. Pour the sauce over and gently toss to coat the pasta. Top with the prosciutto/mushroom mixture and sprinkle with parsley. Optional: Top individual servings with a dollop of Traditional Tomato Sauce. Genuine Italian Prosciutto which has been aged for 14 months. A 4-pound cut (not sliced) vacuum sealed.